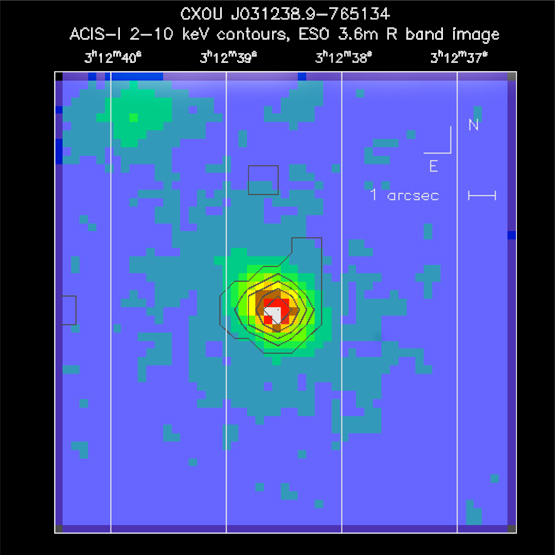 Chandra ACIS contours overlaid on an optical image of a newly discovered powerful X-ray source in a distant galaxy . When viewed with an optical telescope, this galaxy appears normal. But when the Chandra X-ray Observatory observed the galaxy during calibration testing in September 1999, it discovered an unusually strong source of X rays. Located 2.5 billion light years from Earth, the X-ray source is concentrated in the central regions of the galaxy and could be another example of a veiled black hole. This discovery adds to a growing body of evidence that our census of energetic black hole sources in galaxies is far from complete. A team of Italian and Harvard-Smithsonian scientists, led by Fabrizio Fiore, of the Astronomical Observatory of Rome, and the Harvard-Smithsonian Center for Astrophysics, made the discovery. The vertical lines in the image are part of a grid to locate the source in the sky. The X-ray contours represent brightness levels and are consistent with a point-like source in the center of the galaxy. The colors in the optical image also represent brightness levels. The source name is CXOUJ, which defines its position in the sky. Scale Image is 18.7 arcsec across. Coordinates (J2000) RA 03h 12m 38.90s | Dec -76° 51' 34"